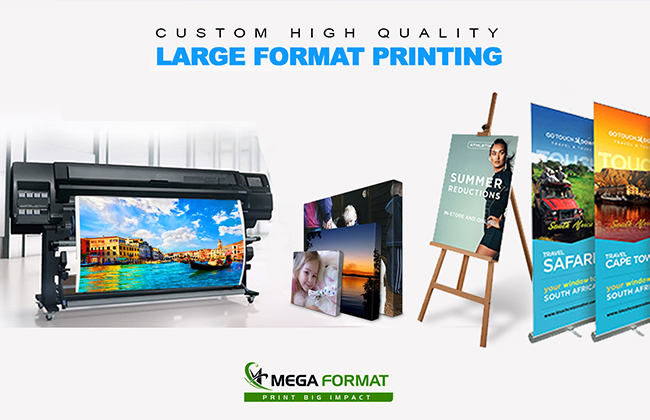 Mega Format offers online large format printing service in Brooklyn, serving New York’s very own small business owners and large corporations for their printing needs. With over fourteen years of experience in the wide format printing industry. We have the knowledge and expertise to handle any large print job that you may need. Our top priority is to offer quality products with amazing service at an affordable price, we use the latest latex print technology which enables us to print directly on vinyl, mesh, fabric, boards, PVC and several more materials. Through our online portal, https://megaformat.net we have made it easy for our nationwide customers to order their print jobs online and receive the final print at the desired location across USA. We are your print partners whom you can trust and rely on getting the job done right. To back up our claim, we offer 100% money back guarantee. What is Large Format Printing really? Technically speaking any print that is larger than A3 (regular printer size) is termed as large format prints. These prints are commonly used for commercial or promotional activities to attract a large audience and make an impact. Generally, a large format printer can print any size between 60 inches to 145 feet, because that is the size of the paper roll which is installed into these printers. However, there are even wider printers which are used for printing even larger width. Therefore, the print can be as large as you want. Apart from the standard sizes, it is personalized with your own artwork or graphics as per your requirement. Some of the popular large format prints are used for printing products like Posters, canvas wraps, mounted posters, self-adhesive vinyl, decals and many others are used for corporate events or promotional activities or even for instore and office decore. It is true and widely acknowledged that big advertisement attracts a large audience. Don’t you want to direct people’s attention to your product? Don’t you want to get the right message out? So Make it BIG! Trust me there is not a better way of making your advertising powerful and noticeable than large format printing, at Mega Format. Let us help you to stand out from the crowd and entice your target audience, with colorful and high-quality Large Format Printing products like vinyl banner printing, mesh banner, posters, mounted poster, magnet printing, canvas printing and more. Prepare your design and allow Mega Format the best New York experts in large format printing to take care of your print job. Our technicians at our New York facility will ensure that each printed product is vivid and of a high resolution. · High-quality prints which will not FADE and last for years. · Offer custom size canvas printing, to meet your requirements. · 100% satisfaction guarantee or money back. · Meet your deadlines – ALWAYS. · Professional & Friendly Service. · High quality at a fair price. · Client satisfaction with high-quality deliverable is the prime focus. Order your printing requirements through our online portal – https://megaformat.net upload your custom artwork and get printed product at your door step across USA, Free store pickup is also available for local NY customers. Order online or call us for assistance: 718-855-2627. Mail us for custom quote at sales@megaformat.net.